Exam Board: EdexcelLevel: GCSESubject: ScienceFirst teaching: September 2016First exams: June 2018 The Edexcel GCSE (9-1) Biology, Chemistry and Physics Lab Books are a new type of resource to support all of your GCSE Biology, Chemistry and Physics students in completing the Core Practical requirements. 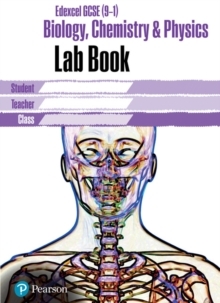 This Lab Book covers all the Core Practicals that students have to perform in preparation for their GCSE Biology, Chemistry and Physics exams. Cheaper and easier than photocopying! he Lab Books will help teachers to:save time and money - we have been able to price the Lab Books so that they are cheaper and easier to use than photocopying worksheets maintain records of what students have done in their Core Practicals. They will help students to:develop a stronger understanding of the skills and knowledge for the assessment of Core Practicals create a record of all of the Core Practical work they will have done in preparation for revision practise answering practical based exam-style questions, in a similar format to the exam. Each Lab Book includes:all the instructions students need to perform the Core Practicals, consistent with our best-selling Edexcel GCSE Online Teaching Resources writing frames for students to record their results and reflect on their work a selection of practical based exam-style questions, taken from our Edexcel GCSE Student Book a Practical Skills Checklist, so that students can track the practical skills they have learned in preparation for the exam an illustrated list of the equipment students will use during their Biology, Chemistry and Physics courses a full list of equations that students need to learn a full set of answers at the back.